Gooey cheese and decadent chocolate are the stuff of my date night dreams. And nobody combines them better than The Melting Pot Orlando. Maybe it’s the moody lighting, maybe it’s just all that chocolate, but dining here always feels like a special treat to savor. While most date nighters may think of The Melting Pot as a go-to for special occasions (and it certainly is), happy hour invites you to treat any ordinary weeknight as a special occasion. Served in the bar area Monday-Friday from 5-7pm at the Orlando location, happy hour is your ticket to indulge for just $19/person. This price includes your choice of cheese fondue to share, a salad, and your choice of any chocolate fondue to share. The drink special is inventive and playful: roll a dice to determine your drink price (more on that later). Plus, there’s live music Wednesday-Friday nights. And a free photo booth! We recently received an invite to test out the happy hour deal…read on for our full report. I’m all for happy hour drink deals, but The Melting Pot Orlando gets extra kudos for its fun and unique happy hour drink deal. Rolling a 1 means your drink is $1. Rolling a 2 means your drink is $2. Rolling a 3 means your drink is ½ price. Rolling a 4, 5 or 6 means your drink is $1 off. 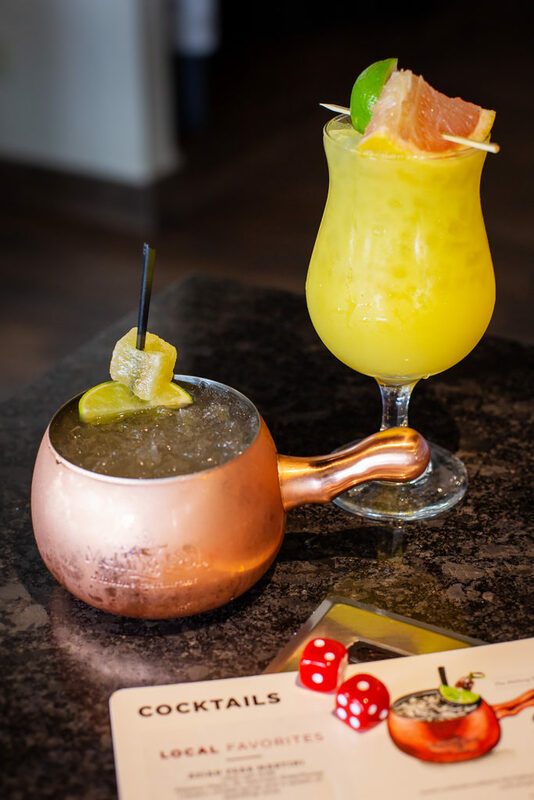 I chose the classic Melting Pot Mule. It’s made with vodka, ginger liquer, fresh mint, lime and Gosling’s ginger beer (the best!) and comes served in the most adorable copper mug shaped like a fondue pot (yes, you can buy the glass). Other cocktail recommendations include the Mangolicious (vodka, pineapple juice and mango syrup, topped off with sparkling moscato) and the Freshly-Picked Margarita (tequila, blood orange and orange liqueurs, agave nectar, and lemon, lime, orange and grapefruit juices). The drink deal is also good for 5oz pours of wines by the glass. What I love about happy hour is that it gives you the Melting Pot experience at a fraction of the price. 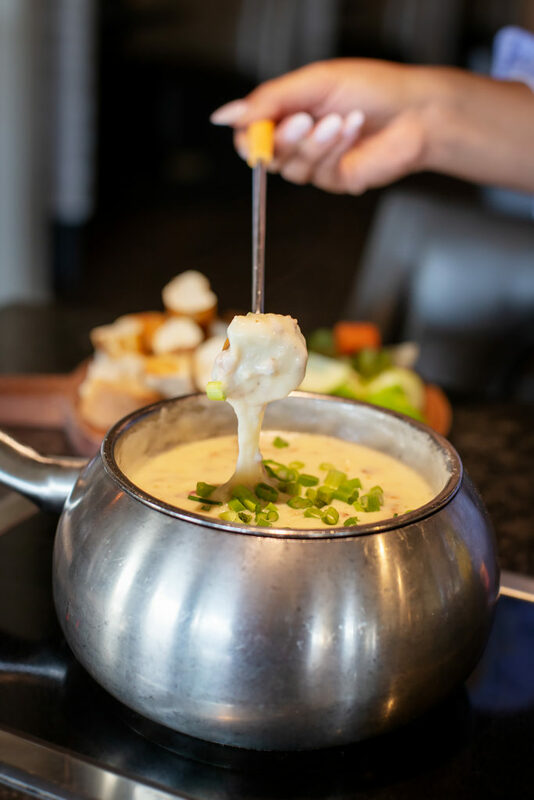 You get to pick a cheese fondue and chocolate fondue to share, plus a salad each, for $19/person. No fondue or salad varieties are off limits for this deal. First, let’s talk cheese. There are eight varieties to choose from, and it will be a difficult choice. My happy hour buddy and I opted for the savory Bacon & Brie, comprised of a mini wheel of brie, gruyere, raclette, fontina, lemon, and white wine topped with bacon and scallions. The cheese course is served with dippers, an assortment of cubed bread, veggies and apples. 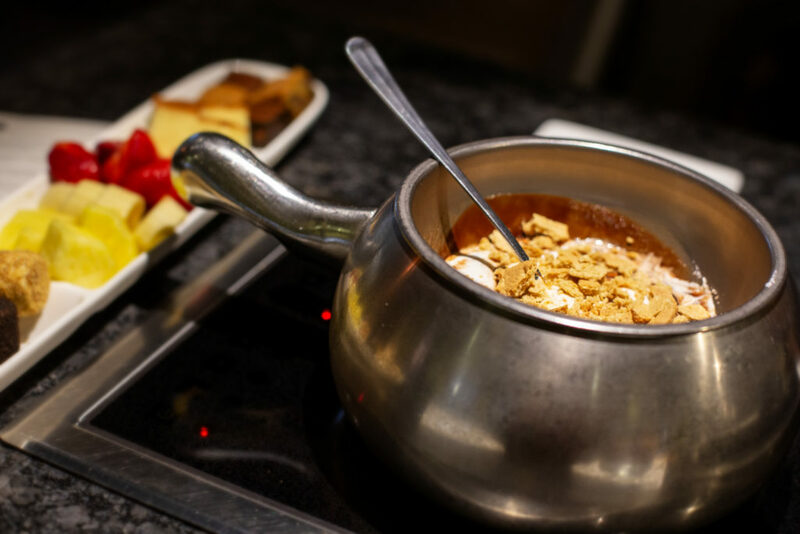 If you’ve never been to The Melting Pot, know that your server will prepare your cheese and chocolate course for you at the table. So sit back and watch it melt. After dipping and dunking to your heart’s content, feast on a side salad. The salad course will make you feel like you’re making a healthy choice, effectively eradicating any guilt about all that cheese you just ate and all the chocolate on the way. 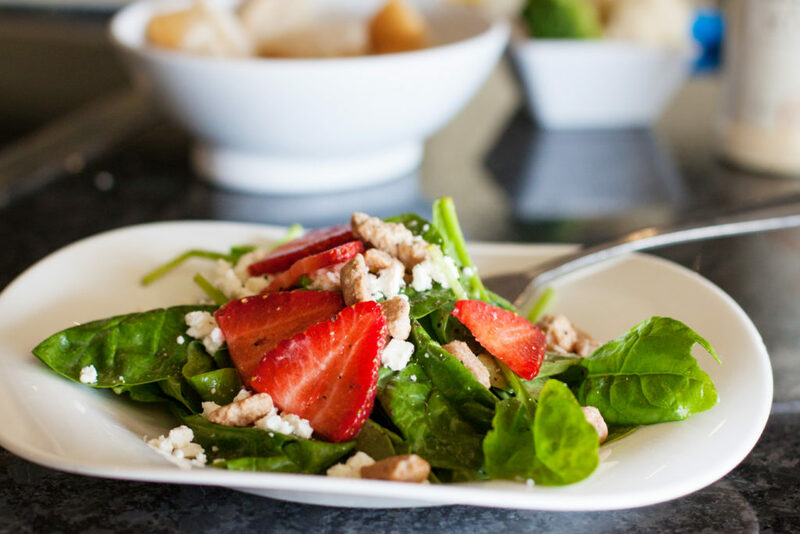 The Stawberry Pecan salad (spinach, stawberries, feta, candied pecans, and lemon poppyseed vinaigrette) is my favorite from the menu. Alas, you will arrive at the true star of your meal: the chocolate fondue. You also have eight choices here, or you can create your own custom mix. The Chocolate S’mores fondue is a drool-worthy blend of milk chocolate, marshmallow cream, and graham cracker bits. Your fondue pot acts as the campfire as the ooey-gooey goodness is flambéed to mimic that toasty fireside flavor. I nearly licked the bowl. Like the cheese course, the chocolate is served with dippers. But this time, bread and veggies are replaced with fresh fruit, mini cubes of cake, rice crispies, brownies, and everything else delicious and good in the world. Drinks: If you’re lucky enough to roll a 1 or a 2, you’ll score one of the best happy hour drink deals in town. Regardless, this adult “drinking game” will add a fun element to your happy hour date. And the cocktails are delicious. Food: At the most, you’ll pay around $60 for two drinks plus the 3-course meal deal. On the flip side, you could score the same meal and 2 drinks for just $40. Either way, it’s an awesome value for a fancy date. Setting: Happy hour is only available in the bar area, but its spacious and has a few cozy booths. The live music is smooth and romantic and won’t hinder your conversation. Oh, and there’s a free photo booth in the back of the restaurant! Melting Pot Orlando scores an A. How could anything involving cheese and chocolate score anything less? The service is top notch, the food delicious, and the drink deal adds a note of playfulness to an already fun dining experience. Try it for your next girls’ night or date night outing. Happy hour is served in the bar area Monday-Friday from 5-7pm. Check out the full menu here. Disclosure: Melting Pot Orlando is one of our valued advertising partners. This meal was provided by Melting Pot Orlando at no cost to the writer.